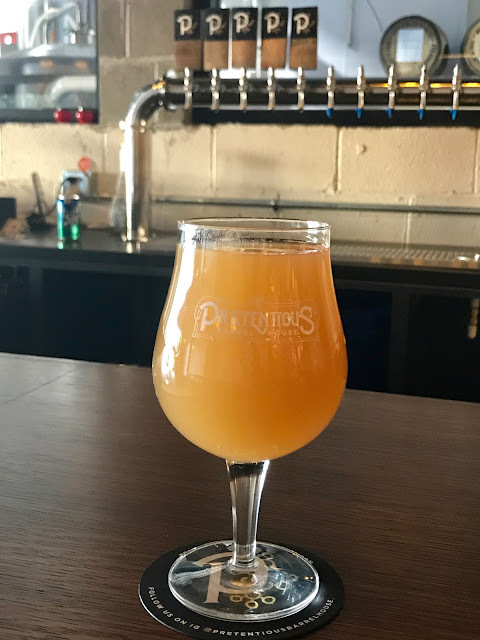 Fresno, Ohio was unknown to me until I visited Wooly Pig. It's a township east of Columbus and south of Cleveland, with a fair amount of farmland and more animals than people. And now it's home to a farm-based craft brewery named for the fuzzy porcine residents of the farm. 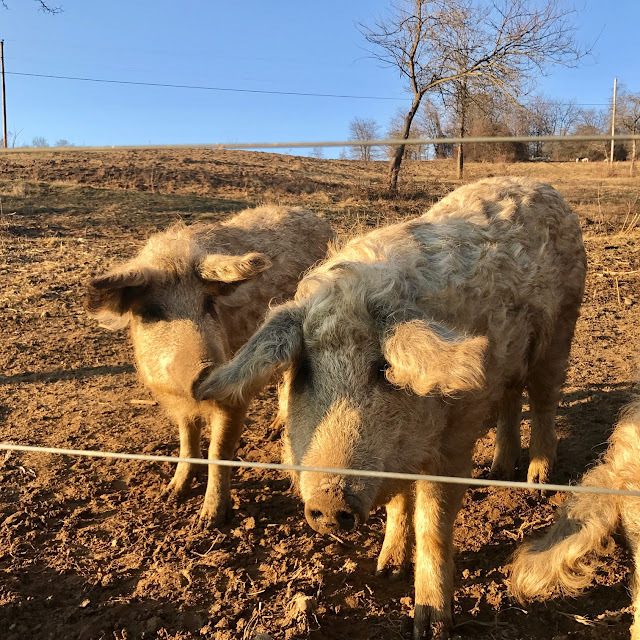 In fact, as I concluded my 90-minute drive from Columbus, I was greeted by the wooly (mangalitsa) pigs who were grazing in the pasture adjacent to the gravel parking lot. The pigs were curious as I walked up to the fence (it's electric, so don't touch!) to say hello and to photograph them. I didn't get too close to the cute piglets, as their mothers were vocally protective of them. Those piglets on the left? Adorable! My first glimpse of the farm, other than the pigs, was brief. The sun was setting and it was cold. It was not a day to explore. 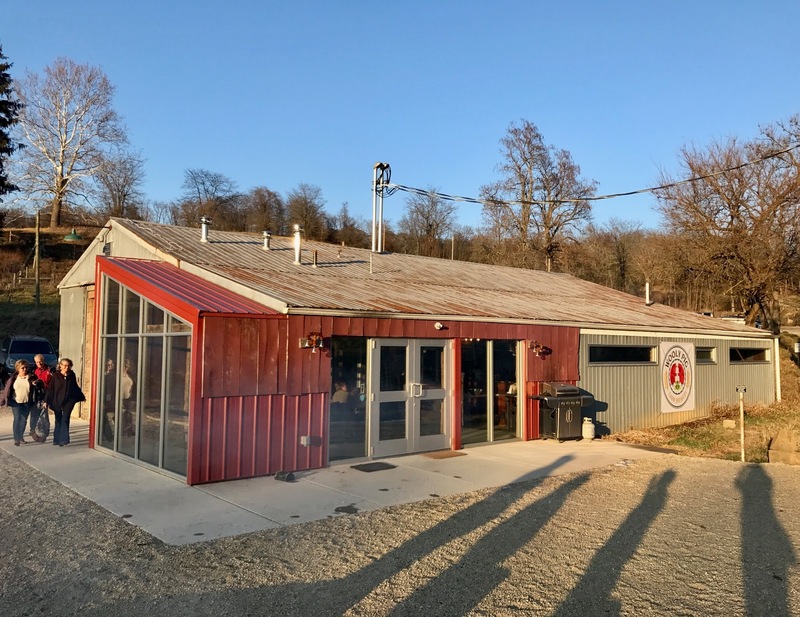 The brewery and a big red barn sit atop a hill, and there are trees on the property. It must be a very pretty farm come springtime. 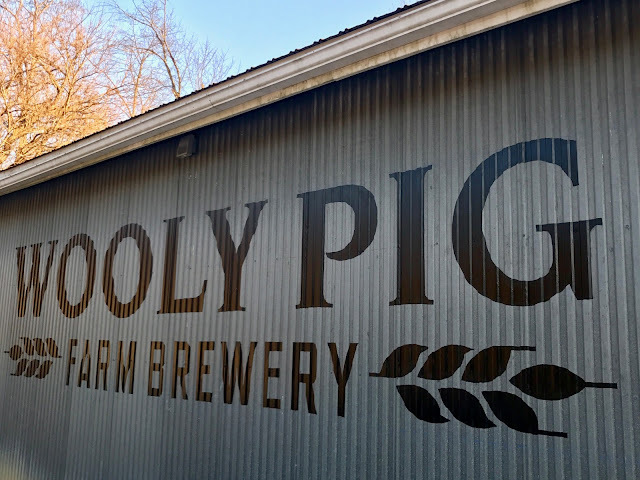 According to the Wooly Pig website, visitors will be able to tour it, to see the pigs munching on spent grain from the brewery, to meet the other animal residents, and to see what's growing there (crops of hops perhaps, according to the farm layout on the website). The barn that will become an event venue; and that grassy area? Perfect for picnicking! I walked toward the red barn, which will eventually become an event space, past the pigs and down to the far end of the brewery where guests enter. There's a nice yard, which will be perfect for picnics and beer drinking in warm weather. For the colder months, there's a fire pit on the spacious patio, and it was in use on the frigid evening of my visit. 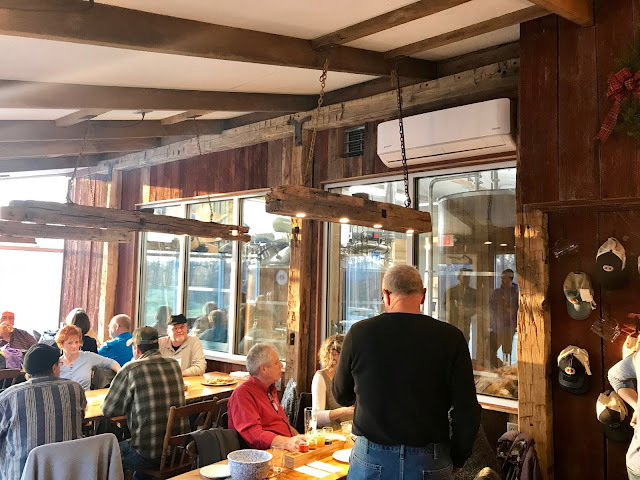 Turning to the taproom entrance, I saw big, wide windows overlooking the barn. I found brewmaster Kevin Ely out at the fire pit and he took me inside for a tour. We walked through the taproom and into the brewing space. I would wait a little while before getting to sample the beers. Kevin shared his passion for brewing German-style beers, honed through many visits to Bavaria during his time in commercial brewing. Kevin's resume is impressive. He committed to his craft at an early age, studying biochemistry and brewing science at University of California, Davis. (Did you know that brewing could be your university major?) In his 17-year career, he worked for several breweries out west, most notably Uinta Brewing Co. in Salt Lake City. 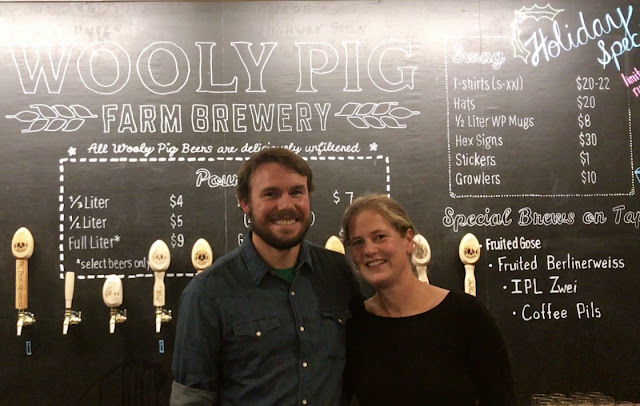 Owning his own brewery seemed to be the inevitable next step in Kevin's career (and I'm happier for it, having enjoyed my time at Wooly Pig). 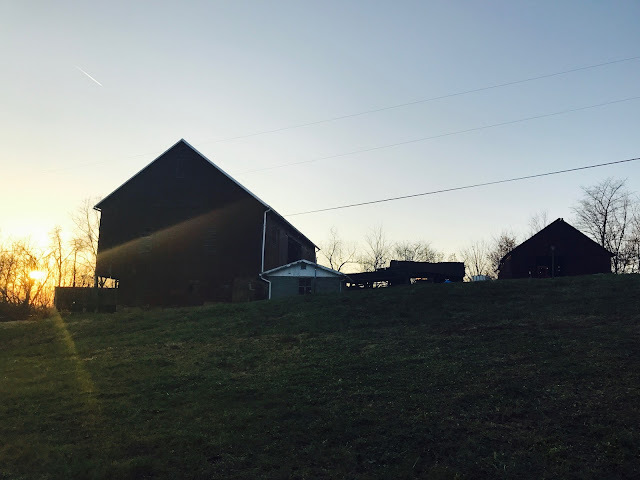 The farm was a perfect place to build the brewery, as it reminded Kevin of his beloved visits to farm breweries in Bavaria, which were self-sustaining entities producing food and beer and giving back to the land. At Wooly Pig, the water used in the brewing process comes from a well on the property; it was tested for safety and flavor. The spent grain from the brewing is fed to the pigs. 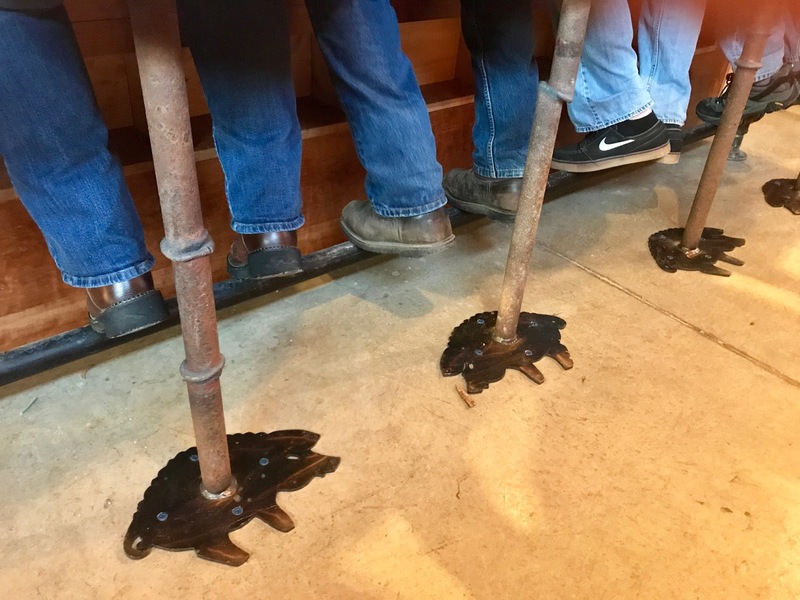 Eventually, mature pigs will be humanely slaughtered and used to produce sausages served in the taproom's small kitchen. 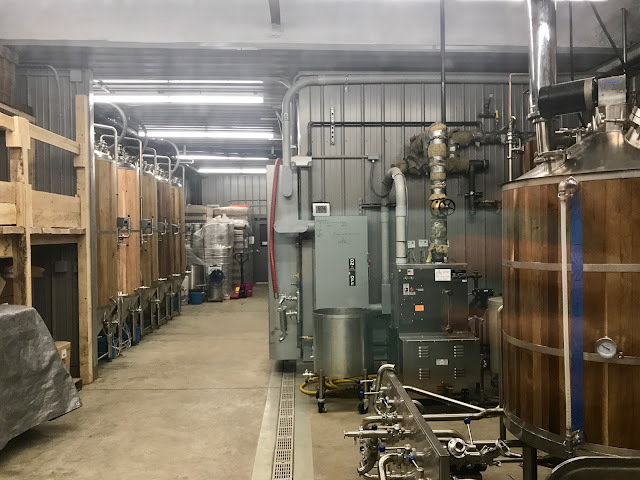 The brewery also has its own power source in the form of a hot water boiler that produces steam. The brewing equipment was beautiful to behold. 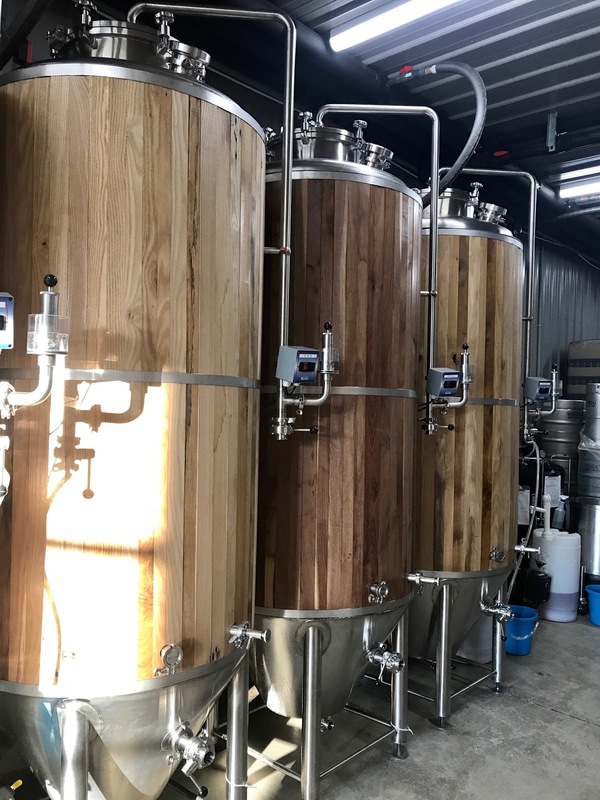 The kettles and fermenters are hand-clad in wooden planks reclaimed from demolished farm buildings or fallen trees. Kevin operates a 5-barrel system with three brewing vessels. His fermenters are 10-barrel. The brewery was designed smart, with room to expand as production grows. There's a bottling machine, and Wooly Pig is already making brisk sales of 4-packs to go. Not just any 4-packs, but these bottles each hold 500 ml (another nod to European ways). And because Kevin focuses on German styles, there's a lagering room in the walk-in cooler. This is where lager style beers finish their fermentation in cold storage. 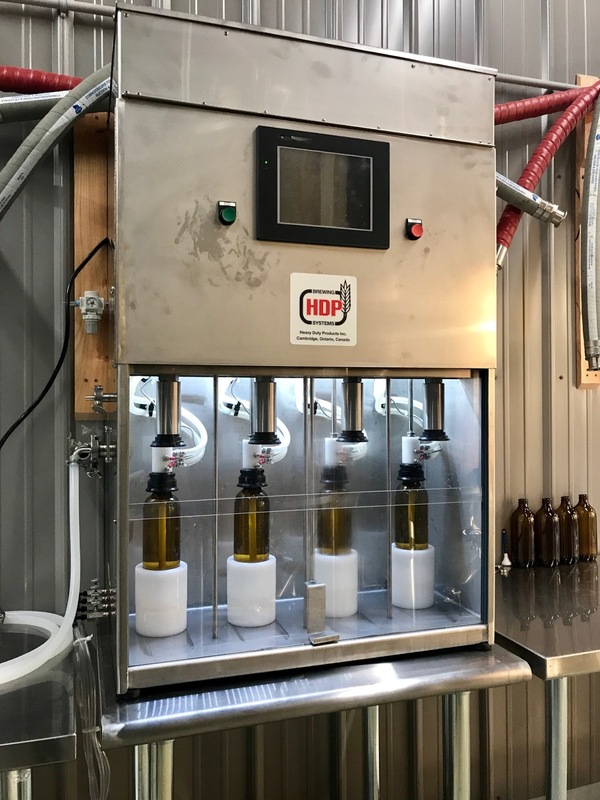 The process requires additional lagering tanks and more time added to the production schedule, so many small breweries only produce ales. But Kevin is a pro; he knows how to lager. I was impressed seeing this in a family-run brewery. About the family - Kevin Ely is not in this alone. The farm is a partnership with his wife Jael Malenke, her brother Aaron and sister-in-law Lauren. Other Malenke family members play a role as well, rounding out a diverse set of credentials: scientist, farmer, veterinarian, entrepreneur, blacksmith and creative writer. I was quite ready for some lagers after my tour with Kevin. 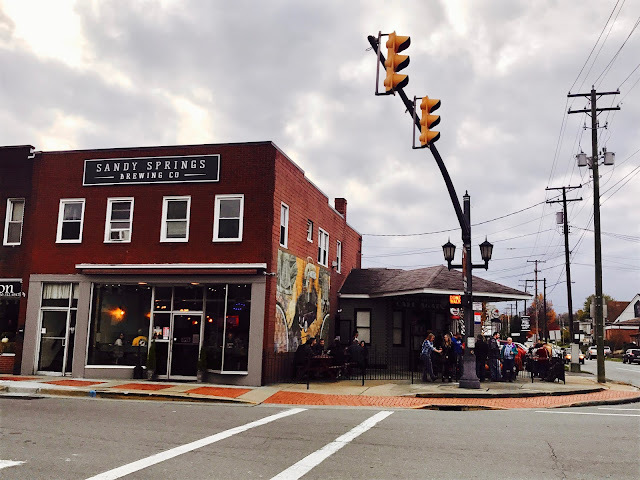 It was early Saturday evening of opening weekend and the taproom was busy, a great sign. I waited a few minutes for a spot to open up at the bar, my preferred location for tasting beer. There were more barstools lining the picture windows and benches in the main section of the room, but I sat at the bar overlooking the action. Though I had my favorites, all styles were well done. The beers were created by a professional brewmaster, and it was evident. They were nicely balanced and I liked the fact that they were unfiltered. As for the taproom itself, can you say cozy? The natural wood provides a warm feel, and there are elements of hand-crafted ironwork throughout. The vibe was very welcoming, as it seemed that the entire Ely-Malenke clan was present, either working behind the bar or elsewhere, or taking a break from the busy opening weekend. They seemed to know every other visitor, so many were clearly locals. 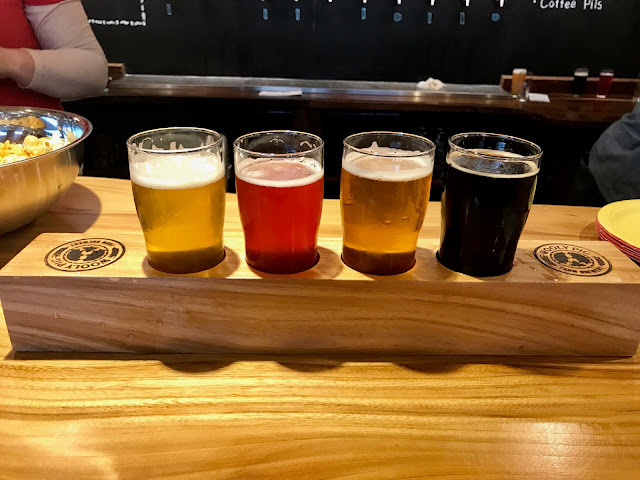 Kevin mentioned that the customers have been a mix of Fresno and other locals from neighboring towns, drive-by traffic from the well-travelled country road, and brewery tourists like me, who came from afar for the opening. Wooly Pig is definitely a destination brewery. I've driven farther for less atmosphere, but I'm likely to return here to experience the farm, especially in warmer weather. The kitchen was not yet open on my visit, but Jael kept the taproom stocked with popcorn and other snacks for us to feed our appetites while drinking the delicious beers. The kitchen will open sometime in the spring. In addition to serving pork sausages, there will be menu items for vegetarian and gluten-free diets. 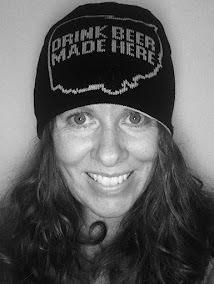 There's merchandise available, and someone on my holiday list will be receiving a 4-pack and a Wooly Pig Farm Brewery mug. You can also pick up a hex sign, a t-shirt or a trucker-style hat. The gear is well-crafted, which was easy to do with such a great logo to start with. I spoke with Jael about Wooly Pig's involvement in the community. They have already participated in community events such as a beer and food pairing dinner. 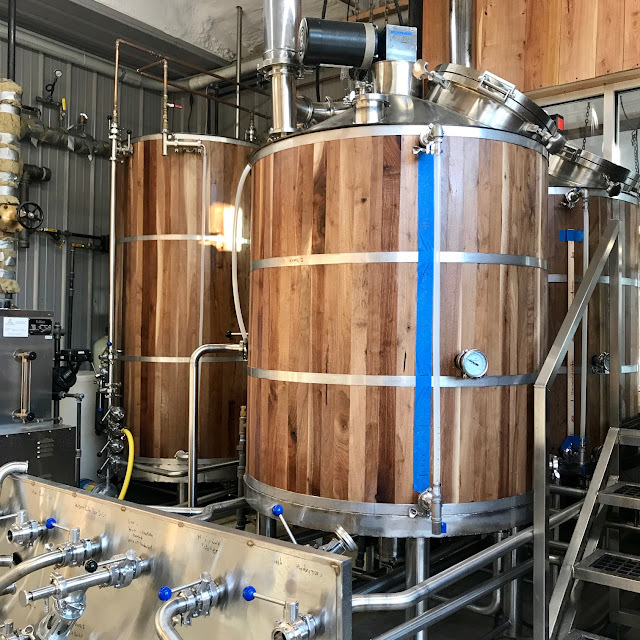 With the Malenke family's history and connections to the Fresno area, there will be more opportunities to engage in local and charity events as the brewery gains momentum. I'm excited to see what's next! Take a half-day to explore the farm, the brewery and the surrounding countryside. Prepare for a break from your smartphone (you might not have a signal in the taproom) and just enjoy being in the moment. 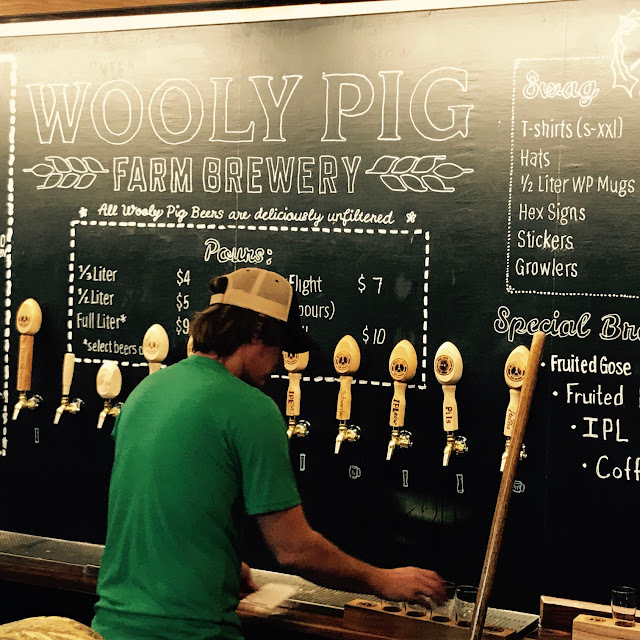 Wooly Pig Farm Brewery is open Wednesday-Thursday 4-9 PM, Friday 4-10 PM, Saturday 1-10 PM. 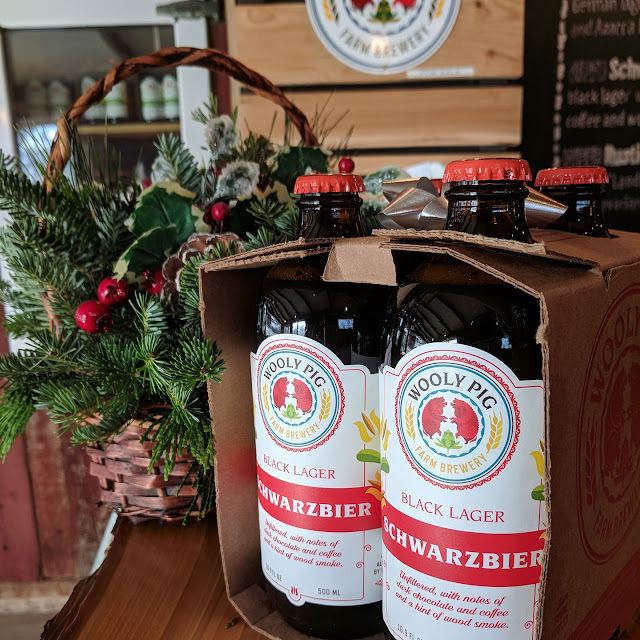 They sell only house beers, which can be carried out in bottle 4-packs or growlers. The farm and taproom are kid-friendly (supervised, of course). Check them out at woolypigfarmbrewery.com or follow them on Facebook and Instagram.